Linux INK (v1.0) "all coins" in 09:20.1 by noellekiq. INK is a minimalist platformer where the player controls a white square, and must get to the exit on each level. 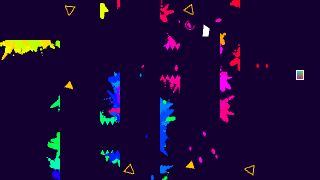 All walls and platforms are initially invisible, and must be gradually revealed by splashing them with colorful paint; a splash of paint erupts from the player character whenever it is killed or does a double jump. noellekiq collects all 20 coins spread throughout the game and clears it in record time.